To Harness or to Quell the Dog’s Eagerness? Something yesterday gave me pause for thought. Here is a familiar story. The person opens the front door and the dog springs forward, dragging them down the drive to the nearest car or bush under which there may be lurking a cat. The dog hears another dog barking and spins at the end of the lead. A bike or car passes and he lunges at it. From the moment the owner picks up the lead he’s in an increasing high state of excitement. The park and freedom are his goal and his nails scrape on the paving slabs as, choking, he strains to get there, pulling his person behind him. I re-visited a young lady yesterday whose young dog, Cooper, though nowhere near as bad as this, after a couple of weeks of diligent work was still hyped up at the start of a walk, intent on dragging her from bush to car sniffing out cats and towing her to the entrance down the road that lead to his country walk. The usual methods of dealing with this were simply slow and frustrating for them both. We had been concentrating on a calm exit from the house, as one does, and then on loose-lead walking work outside, using every attention-getting technique we could think of to capture his attention. Amongst usual instructions are: to simply wait with the door open and the lead tight for however long it takes until the dog has calmed down, reward and maybe click the dog for every calm moment or relaxation of the lead, call the dog back, turn around, ‘Let’s Go’, reward every slackening with a forward step, teach attention-on-owner techniques, control the dog by asking it to sit, keep going in and out of the house until he realises nothing is going to happen and so on – depending upon the trainer’s preference. Watching Cooper as, under control until the door opened whereupon he charged out, got me thinking. Why were we actually trying to deal with the pulling and lunging at all? The dog-in-training should, by this stage, be fine walking on a loose lead around the house and garden, so technique isn’t the problem. Arousal is the problem. Why, instead, were we not addressing what drives him to behave like this, the excitement and eagerness, by tackling the problem at source? Cooper would leave the house raring to go, excited and eager. How about harnessing this energy instead of fighting it? After waiting for calmness at the door, instead of trying to prevent him then leaping forward, why not instead go with the flow and initiate a jog – diffuse some of his excitement before getting down to the loose-lead work? I had the lady running down to the end of the road and back with an ecstatic dog running beside her on a slack lead; then back to the house and round and about for several minutes (bless her!). Very soon she could reduce speed to a brisk walk with her lovely dog walking beautifully beside her, taking no notice of his usual ‘cat-watch’ locations. 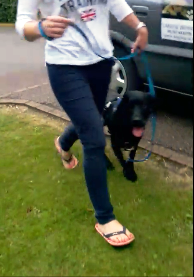 Here is a short video showing how after not much more than five minutes the walking outside her house had transformed from a battle of wills to dog and lady walking in harmony, all by harnessing his excitement and making practical use of it. Having taken the edge of Cooper’s excitement, she can gradually reduce speed until she’s walking at a normal pace before finally leaving the road and going through that gate to the freedom, grass, trees and doggy messages. Obviously there are many instances where this approach would be inappropriate or even dangerous, but surely where the environment is suitable and the person sufficiently fit, initiating something energetic but controlled at the start of a walk is worth a go. Here is my story of Cooper when I first met him a couple of weeks ago. This entry was posted in behaviour, PAWS for Thought and tagged chasing cats, excited dog, excitement, jogging with dog, loose lead walking, loose leash, pulling on lead, running with dog. Bookmark the permalink. 1 Response to To Harness or to Quell the Dog’s Eagerness?